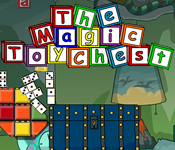 The Magic Toy Chest Game Site: The Magic Toy Chest is new, improved, and available! The Magic Toy Chest is new, improved, and available! The Magic Toy Chest is finally available for Windows PC! After spending crazy cash money and time to update all the visuals, stamp out the bugs, and implement new features, the wacky physics sandbox puzzle game is here. Check out the Free Demo! For additional information on the Magic Toy Chest (or for screenshots, evaluation copy or demo), please visit http://www.graduategames.com/toygame.php.